Mackenzie Phillips is a man lost in "The Great Sadness". Lost from God, from his family, and from any sort of real happiness. His youngest daughter, Missy, was brutally murdered in an abandoned shack in the mountains while on a family camping trip four years earlier, and Mackenzie is having a hard time moving on with his life. He receives a suspicious letter from "Papa", inviting him to go back to the shack to find some answers, and incredulously, he does return to the focal point of his sadness. What he finds there, is supposed redemption. I don't know what to say about this book. I didn't really like it, but I'm not a big fan of religious fiction or even self help books for that matter because of too much information in too small of a space. I would rather read these types of books in stages when the need arises, rather than in one big gulping swallow. The writing was sub par and the dialog choppy and unrealistic in the beginning but improved as the book moved along, until really there are only pages upon pages of dialog. I could barely draw breath. Young not only likes to say his point over and over, he means to stomp it into your brain until you know nothing else. At the same time, I can see why so many people like this book. Young manages to make God, Jesus and the Holy Ghost more relatable and human in a scary world where religion has become out of reach for some. 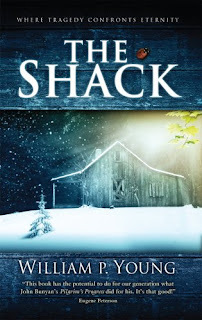 The Shack is Young's personal guide to finding your own way through the murkiness and sludge that make up the problems in our world today. His opinions are rarely theologically or scripturally based, but rather, perhaps, a way he's learned to handle the grief in his life. If that helps other people, fine by me. Mackenzie Phillips?! wasn't she the coke-head who played the older daughter on One Day At A Time? Maybe Young was a fan of the poor girl. ahem. you're only "dated" if you know that Mackenzie is the daughter of John Phillips of The Mamas & The Papas, and you still some of their LP's stashed in the attic somewhere. And that one of the mama's died of a drug overdose...I don't have any of their LP's, but I do have some original Ike and Tina. Yes that is scary. "... an' ev'rybody's gettin' fat 'cept Mama Cass..."
okay, then. it's karaoke night next Friday, at Jason and Amanda's. i'll bring the pizza. Don't I feel out of place. Old enough to know who The Mamas and the Papas and LPs are, but manage to be ignorant of Mackenzie Philips, though I didn't watch One Day at a Time nor did I like Wilson Philips, gah! Christina, I'm even worse: I've heard of the Mamas and the Papas though don't know any of their songs, I have no idea who McKenzie Philips is, or Wilson Philips, or One Day At a Time. As for karaoke, you guys have fun. I'm taking the kids and getting us all out of the way. You should know, though, that Jason received some sort of award (with a trophe and everything) for his Karaoke skills. At work, no less. Amanda, i was kinda looking forward to you and Jason doing a "Proud Mary" duet a la Ike and Tina Turner. that's before your time, i know. but there should be a video of this out on YouTube. i think you & Jason singing "Proud Mary" (and a video being made of it) should be put to a vote by the 5-Squared group. i predict the final tally would be 11-2, maybe even 12-1. Jason adds that now is the time when I lean over and give him a dirty look. I promise the total wouldn't be 12-1.
my 5-Squared brethren and sistren will back me up on this. Vox populi and all that.